You can make these in advance and then toast the crumpets lightly on both sides just before serving. Warm the milk in a saucepan set over a low to medium heat. Transfer to a large mixing bowl with the tepid water, then add the yeast and sugar. After about 15 minutes it should all be dissolved and the liquid should have become frothy. Sift the flour, baking soda and salt into a separate clean, dry bowl. Create a well in the middle, then pour in your yeast and milk mixture. Start to whisk from the middle outwards, combining all the ingredients until you have the consistency of double cream. You may need to add a little water, but it will take a few minutes to reach the consistency you want. Cover the bowl with a clean, damp tea towel and set aside for 45 minutes, until you start to see little bubbles on the top. Thoroughly oil four 10cm egg rings with the vegetable oil and put a little oil in a large frying pan set over a medium-high heat. Arrange the egg rings in the frying pan. Once the pan has heated up, place 4 tablespoons of batter in each ring and cook for 5 minutes, until you start to see bubbles on the top. When the bubbles burst, leaving the distinctive little holes on top of the crumpet, lift off the rings with a tongs and turn the crumpets. Cook for a further minute on the other side, until golden. You’ll need to oil the pan and rings again before cooking the next lot. 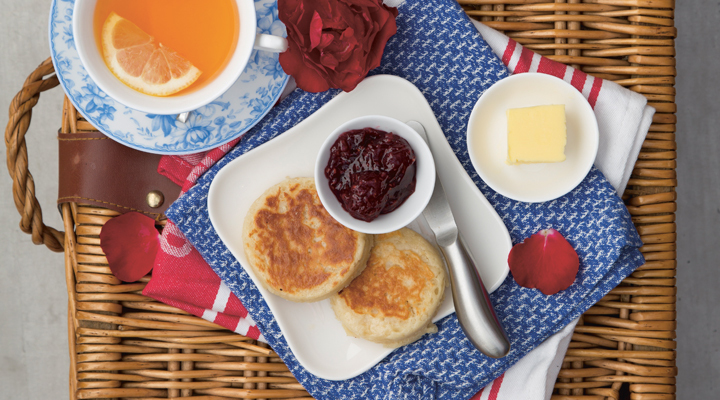 Serve the crumpets warm with lots of butter and jam.